I think I've been making this recipe longer than any in my collection. Over twenty years. I didn't cook much as a kid, but I found this recipe in a magazine, and made it for my parents and brothers to rave reviews. It's curious - it doesn't seem like the sort of recipe that would've been in Sassy or Seventeen, which are the magazines I read back then, so I must have been flipping through one of my parents' magazines and found it. I guess you could say this was the start of my cooking adventures, and somehow I've hung on to the magazine clipping for all these years, breaking out the recipe each fall to make this savory dish for my own family. Prepare macaroni as label directs, but don't use salt in water. Drain and set aside. Meanwhile, in large pot over medium-high heat, cook carrots, onion, and garlic in olive oil until vegetables begin to brown. Add zucchini and yellow squash, cook until all vegetables are tender-crisp. Stir in chili powder and salt, cook 1 minute. Add tomatoes with their liquid, corn with its liquid, chilis with their liquid, tomato paste, hot pepper sauce, and 2 cups of water. Over high heat, bring to boiling. Reduce heat to low, simmer, uncovered, 20 minutes. Stir in beans and macaroni, heat through. Makes 6 main dish servings (we typically have plenty of leftovers - it makes a lot). 390 calories per serving. You could easily convert this to gluten free, if needed, by omitting the pasta or using a gluten free version. Hope you enjoy this recipe as much as my family has! Readers, is there any recipe you've been making for most of your life? This sounds wonderful. The weather here has just turned cold. This would be great on crisp fall night. THIS LOOKS SO GOOD . . I may have to give it a try. Perfect recipe for chilli weather! Thanks for sharing this! Yum! Years ago, my sister-in-law started gathering some favorite family recipes. She put together a family cookbook for everyone for Christmas. It is filled with the recipes (including who was known for cooking it) and photos from family get-togethers. Every so often, she gifts us with some new pages! Oh, this looks so good! Damn you Paleo diet! Lol. I love chili in the winter! Thanks for sharing, this looks yummy. noodles in chili, who would have thought but I bet it bulks it up nicely..looks very appetizing. Sounds delicious- but I have to leave out the pasta- dh is a diabetic. You should make printables or pin this boxes for your recipes! It looks and sounds delicious! Thank you for sharing your recipe. Yummy! Thank you for sharing. :). I must try it! I always put elbow macaroni in my chili. My mom always made it like that. My husband actually hated Chili until I started making it that way! This sounds really good! Definitely something I would enjoy. Yummy! This looks like a chili that I would really enjoy. Thank you for sharing this. 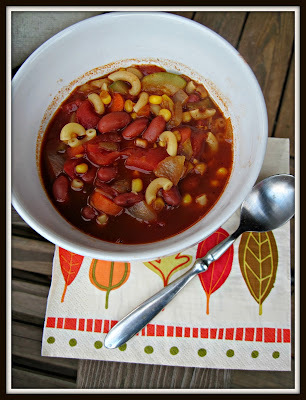 This is right up my alley--I love veggie chili. I think Larry would like it too. When my daughter was in her early teens she was a vegetarian and we had to make special meals for her since no one else in the family was. The chili looks good, I bet everyone enjoys it, vegetarian or no. Hi Lisa: My hometown has a slew of Greek Chili parlors that use unsweetened chocolate, cloves, cinnamon and finely graded beef. But I'll mail this off to family back home. Sounds good! This does sound really good and we always have to have some type of noodle in our chili. Almost looks like Minestrone soup. I have a few well worn recipes! Look so delicious. Thank you for sharing. The words "Sassy" and "Seventeen" made me laugh. Oh memories. This also looks delicious.